The structure of the flow behind wings with finite span (3D) is significantly more complex than the flow behind infinite span (2D) wings. It has been shown that the presence of wingtip vortices behind finite span wings significantly modifies the geometry of the wake flow. It is felt that this modification alters the dynamics of interaction between leading and trailing edge vorticity in a manner that affects the ability of 2D flapping wings to produce thrust. A model of the mean flow skeleton has been proposed from qualitative flow visualization experiments. An unambiguous quantitative representation of the actual flow is required for comparison to the proposed model. To accomplish this the full 3D 3C velocity is required in the volume behind the 3D flapping wing. It is proposed to use stereoscopic multigrid digital particle image velocimetry (SMDPIV) measurements to investigate this unsteady oscillatory flow. This paper reports preliminary SMDPIV measurements along the plane of a symmetrical NACA-profile wing at a Strouhal number of 0.35. Phase averaged measurements are used to investigate the complex flow topology and the influence of the forcing flow on the evolution of the large scale structure of a jet-flow. 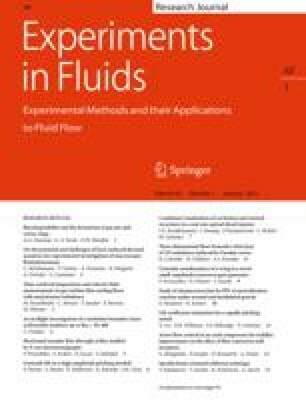 This paper focuses on optimizing the SMDPIV experimental methodology applied to liquid flows. By refining the 2D 3C technique, the 3D topology of the flow can be investigated with a high degree of accuracy and repeatability. Preliminary results show that the flow is characterized by two pairs of coherent structures of positive and negative vorticity. The arrangement of these structures in the flow is controlled by the motion of the wing. Vorticity of opposite rotation is shed at the extreme heave and pitch positions of the aerofoil to set up a thrust indicative vortex street in support of the suggested topological model. Financial support from the ARC for undertaking this research is greatly appreciated.